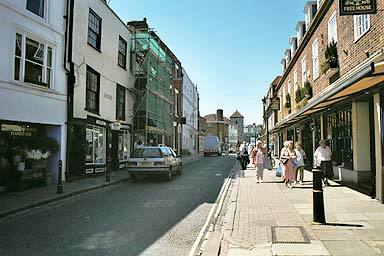 Burgate runs parallel to Canterbury's main street and leads down to the Cathedral gate. It seems to have attracted `high class' shops like Laura Ashley. Liberty used to be here too, but has gone. Some of the buildings at this end of Burgate survived the wartime bombing, many did not. As we travel down towards the Cathedral, the buildings on your right border the Cathedral grounds. The tower in the distance is the remains of the Catholic church, St. Mary Magdelene's tower. On the immediate right is a new pub that opened in 1997.